…….while we’re on the subject of Twitter, we’re trying to work out the pros and cons of ‘locking’ Twitter feeds? More and more people seem to be protecting their privacy in this way – @tomjennings just saw an Ovum analyst talking about it – but, to my mind, it kind of obviates the whole point of Twitter being an open environment for communication. Future Publishing’s Paul Douglas also recently commented that he was surprised to see an (unnamed) PR Agency lock their feed; surely this is a shining example of how locking your feed negates the purpose of being on Twitter; especially if it’s from a business perspective? Twitter lists – start of something new? Twitter lists is being rolled out and if you haven’t already had the option to create lists added to your profile, you will shortly. The idea is that you can create lists of followers, much like setting up separate groups in Tweetdeck, to better help you organise the way you follow particular streams. • Will Twitter lists end up being just another popularity contest? • Is the next measure of a brand’s twitter popularity the number of lists it appears on? • Should you be able to opt-out of being on someone else’s list? • Should you be notified when you are added to a list? As PR and digital marketing pros; how should we be using lists? In terms of client engagement, should we be working to get our clients on lists? Will it be another measure of popularity and/or influence on Twitter and in social media? Exactly how consumers will embrace Twitter lists will depend on a number of factors, I think. At first, it will mimic Twibes and TweekDeck groups. Celebrities, mates, news feeds. Also, will consumers abandon lists they have already started, or add to them? Will TweetDeck and other providers now include list functionality in their functionality? A number of EdelFolk lists have sprung up already. As for tech media, I have groups in Tweetdeck, do you I necessarily want other PRs and journos to know that I am stalking them? AKQA showed this at a meeting on Tuesday, talking about collaboration and the power of crowd-sourced creativity – all the usual stuff we always bang on about. But this is incredible. It’s a music video from a fairly sketchy band called Sour. They got their fans to work together to make a video for their new song. It looks like it must’ve been the most monumental ball-ache of an edit, but the end result is truly brilliant. after the recent curry-inspired song list, we’re on a roll (literally) with some cheese-inspired titles… again, please add your suggestions below! ok, ok – sorry for the appalling headline pun… I nipped out for a sneaky glass of wine at half nine the other night to read the paper, but instead bought the New Scientist instead which I do sometimes; nice read but my head would go numb if i read it weekly. Some very interesting stuff in it this week, some which may form the basis of something else later on – but one news story that i thought was a bit weird, was research that found there was a correlation between the length of a duck’s errr ‘todger’ and the likelihood of that duck getting bird flu. Honestly… the shorter it is, the more likely they are to get bird flu: ‘FACT’ according to scientists. My immediate thought was the obvious question; about why on earth would scientists even THINK of studying this in the first place – what kind of mental quantum leap is needed to come up with that ‘brilliant experiment’? I also thought, do you think there are also now lots of ducks, with or without bird flu, waddling around trying not to sneeze as this might be misinterpreted by lady-ducks? "i did not just sneeze - i did NOT just sneeze, okay?" I’ve been playing around with Google Sidewiki today. It got a bit of attention when it launched a few weeks ago, but I think it was announced at the same time as Google Wave, which seems to have dominated the chatter. A quick summary for those that don’t know. Sidewiki is a tool which is downloadable as part of the Google Toolbar for your browser. Once you have it, it allows you to post comments on any website you like…whether that website wants you to or not. You also need to have Sidewiki to see the comments that other people have made. 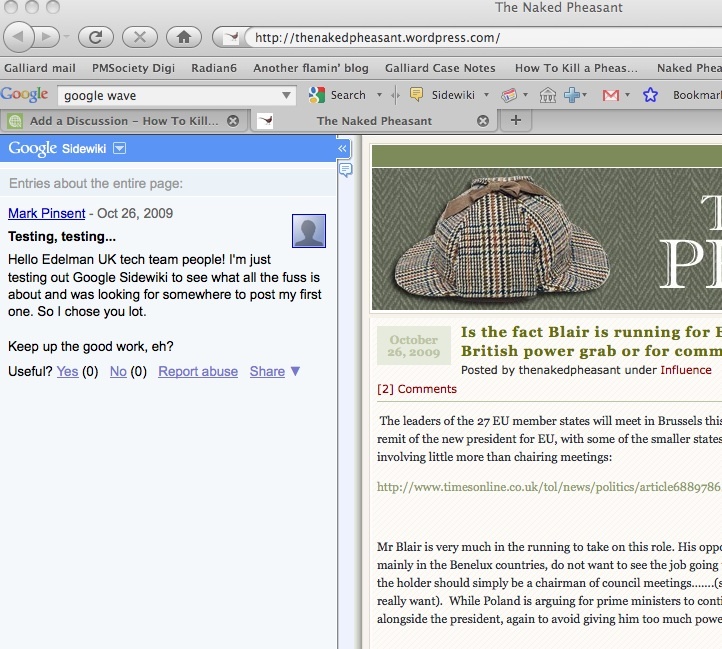 The picture here is a screen grab of the Sidewiki comment I posted on The Naked Pheasant. I think it’s great. You can either add a comment to the whole page, or highlight specific part of the page upon which to add your view or additional information. There’s been a fair amount of controversy. You can imagine how some brands are less than impressed with people being able to turn up and write whatever they like next to their webpage. And as far as I understand, there’s no way for a company to get comments removed or edited; they have to rely on the power of the community to vote for the usefulness or otherwise of comments posted which will ultimately rank them. Thing is, the world of Sidewiki is really, really quiet at the moment. The vast majority of sites you visit don’t have any Sidewiki entries, and those that you might expect to attract strong views are sparsely populated. For example, the Ryanair homepage just has one entry right now. It genuinely feels a bit weird…like when you had reason to be in school out of hours and the classrooms and corridors were strangely quiet. Sidewiki may never catch on of course. And if there isn’t a critical mass of people who have downloaded it, the lack of audience for comments will result in people being less than bothered about posting them. It’ll simply spiral down the plughole. But like I say, I’m quite enjoying it. I’m sneaking around the internet leaving random Sidewikis on websites. And of course, unless the site owner has downloaded it themselves, they won’t have a clue that I have. It’s like a bit of secret graffiti. Is the fact Blair is running for EU presidency a British power grab or for common good? Mr Blair is very much in the running to take on this role. His opponents, who can be found mainly in the Benelux countries, do not want to see the job going to a big name and believe that the holder should simply be a chairman of council meetings……. (something which Blair doesn’t really want). While Poland is arguing for prime ministers to continue to have a key role alongside the president, again to avoid giving him too much power. The Foreign Secretary, David Miliband, told the BBC that a Blair presidency would be “very good for Britain as well as very good for Europe”. I have to admit, I agree with Mr Miliband….well certainly with the ‘good for Britain part’….but keen to gather some thought, from across Europe on the latter. So, what do you think, is a Blair Presidency good for Britain and or Europe?